Two very well expressed views on opposite views of abortion. Last TRIVIA question: "Which VP candidate, who also ran for President, debated Bob Dole?" Question: What do you bring to this position that other man could? Going into closing statements, Biden has had 40:08. Ryan has had 38:29. #CNNDebateClock #CNNDebate. In response to what he would bring to the office as a man, Biden answers: My record is about the middle class. 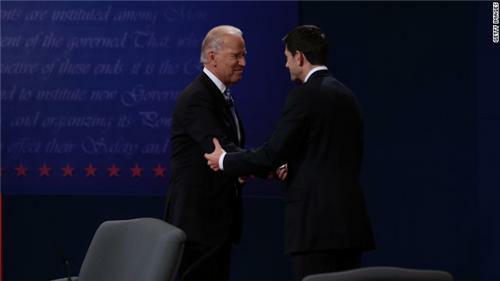 Interesting - a lot of talk between Ryan and Biden after the debate. A different tone after than it was last week. "These are both happy warriors," said John King. "We need more of that in Washington." Okay, Tweeps: Who won the Veep debate? RT @ryanbeckwith: Joe Biden (@JoeBiden) went from 194,275 followers to 210,599 during the debate, an increase of 16,324. Gloria Borger: I don't know how there are undecided people left after this debate. 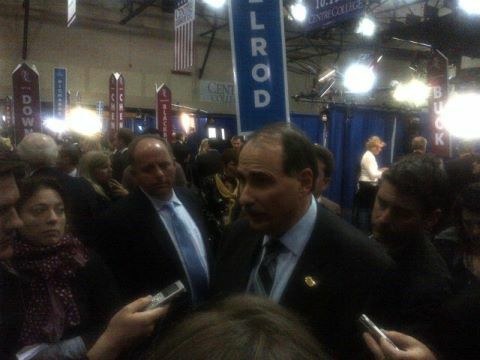 People want strong leaders & tonight Biden was the stronger. POTUS can't be as aggressive in town hall, but needs to be on offense. President Obama told reporters after exiting Air Force One shortly after the debate that he could not be prouder of Vice President Biden. 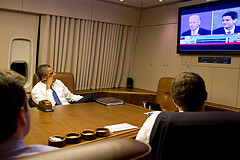 Obama told reporters he though Biden made a very strong case. Very unusual for Obama to approach reporters at at Andrews Air Force base in this fashion. Dead heat from Erin Burnett's undecided Virginia voters. 1/3 said Ryan won, 1/3 said Biden won, 1/3 said it was even. Obama to reporters on Biden's debate: "I'm going to make a special point of saying I thought Joe Biden was terrific. I could not be prouder of him. I thought he made a very strong case. And you know I really think that his passion for making sure that the economy grows for the middle class came through so I'm really proud of him." Conservative CW last week: scowling during debate bad. Conservative CW tonight: smiling during debate bad. Post debate spin from Dems last week: Romney won on style points. Post debate spin from Rs tonight: Biden won on style points.